Kristina Werner is hosting another Color Inspiration challenge on her blog (http://www.kwernerdesign.com/blog/). For this one, you can submit a photo that suggests a color combo. Then readers will vote on the submissions. Finally, one will be selected to use as a color challenge. A neat way to get readers involved! This is my submission. The photo was made last summer of gladiolus from our garden. My husband thoughtfully started planting these for me years ago because they are my favorite flower. This year we have over 300 bulbs! We've planted over half and will continue with a few each weekend until early June. The first ones are already up about 6 inches. We don't label them since there are so many so it is a surprise to see what colors we get each day from early summer on. 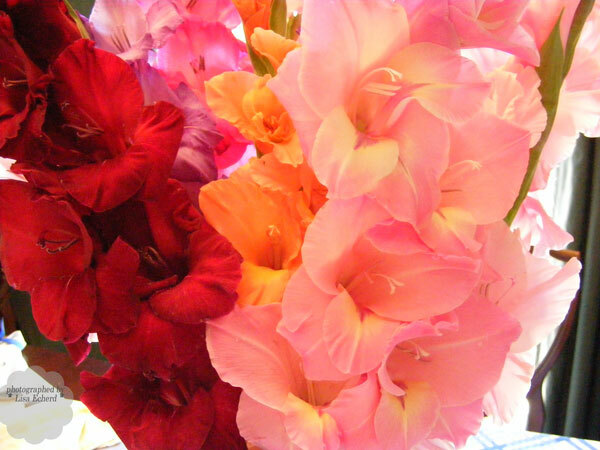 Glads are my favorite because of the gorgeous colors and they make such great cut flowers. I think the colors that would match this photo are: Ruby or Riding Hood Red, Apricot Appeal, and Pink Piroette. (I'm going from memory as I don't have an SU chart in front of me.) You could probably throw in one of the hotter pinks to go with the flower in the back or maybe a touch of Old Olive for the stem.